This is the entrance to the press box of Great American Ball Park. Very few people are allowed through these doors without being physically removed or asked to voice their opinion about all things baseball. These are the empty offices of director of media relations Rob Butcher and assistant directors Larry Herms and Jamie Ramsey. Rob is the press liaison for Team USA during the World Baseball Classic and is currently traveling with the team. Larry and Jamie are heading the media relations efforts for the Reds in Sarasota. This is where the magic happens. Seen here is the “Chuck Kirlin Research Library”/intern office. 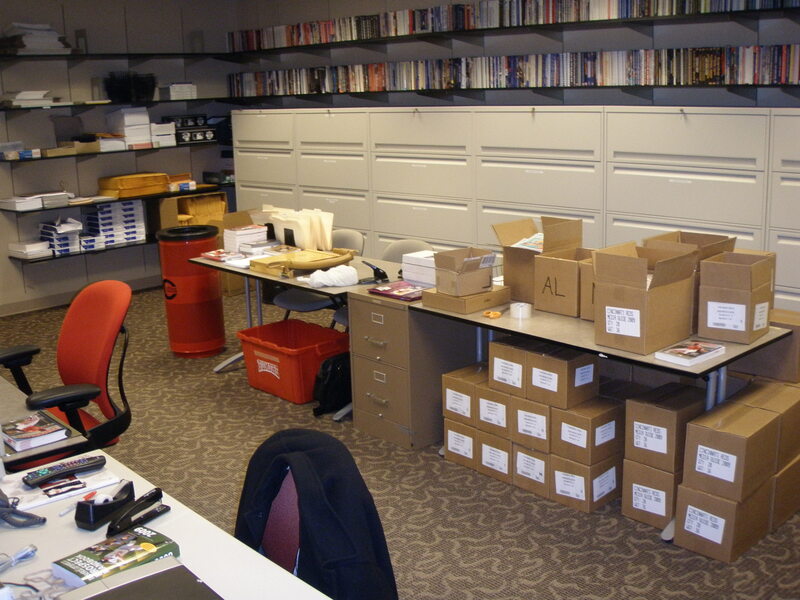 Intern workspaces are visible on the left and the rest of the area is occupied by media guides. These shelves, cabinets and boxes house everything you need to know about baseball. Ever. 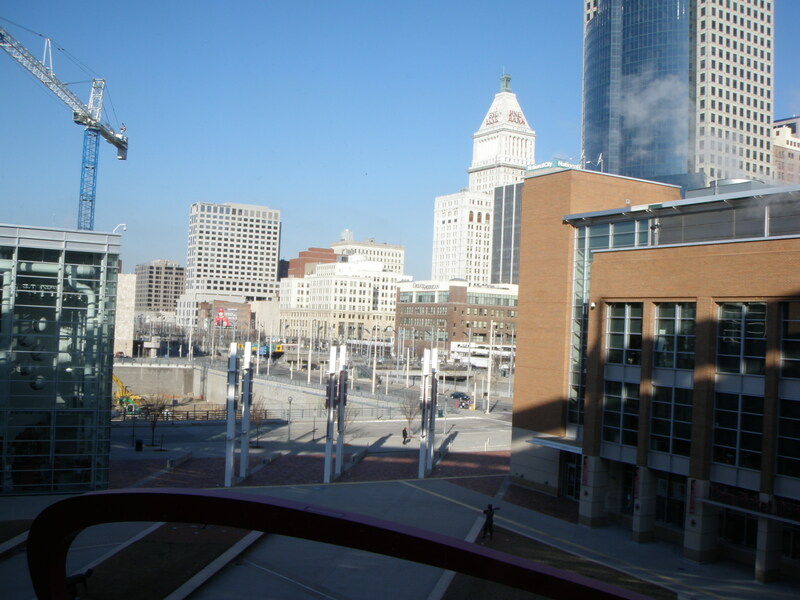 From our offices, this is the view facing downtown Cincinnati. 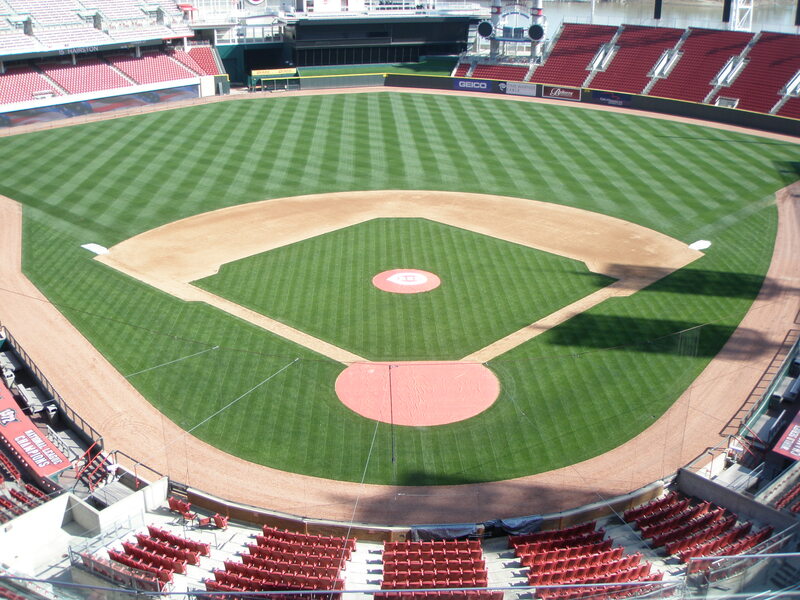 Media relations offices are located just above the home plate gate of Great American Ball Park. Visible on the right is the Reds administration building. On the left is the Reds team store. What would an episode of Cribs be without a peek into the refrigerator? Today, you can see some bits of my lunch. Two ham sandwiches, two Sargento (Plymouth, WI) string cheese sticks, Diet Coke, bottle of water and a V8 (so I feel healthy). 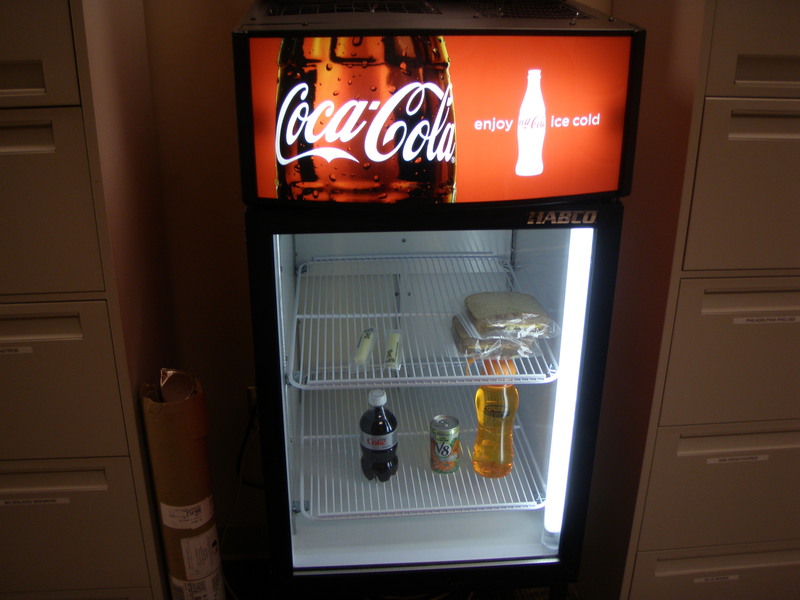 This refrigerator is located in our storage area and was provided by the Coca-Cola company. As you may have heard, GABP has switched over from Pepsi to Coke this year. This is the main press box seating area. 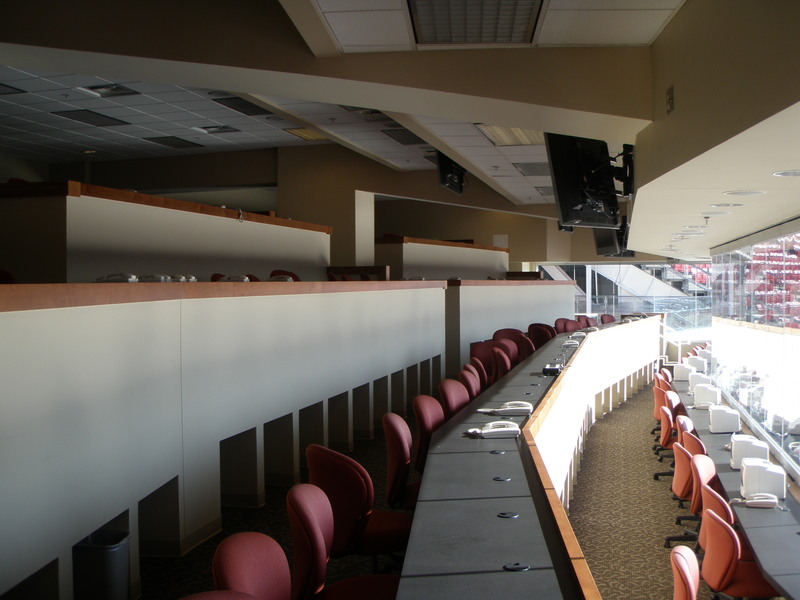 Four levels of seating and televisions make this press box one of the best. 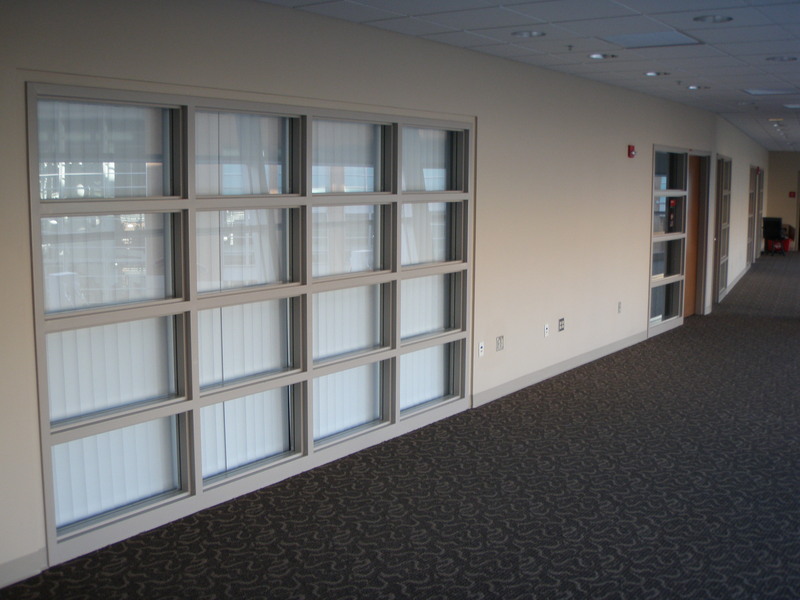 The windows in the front are made to open during games. 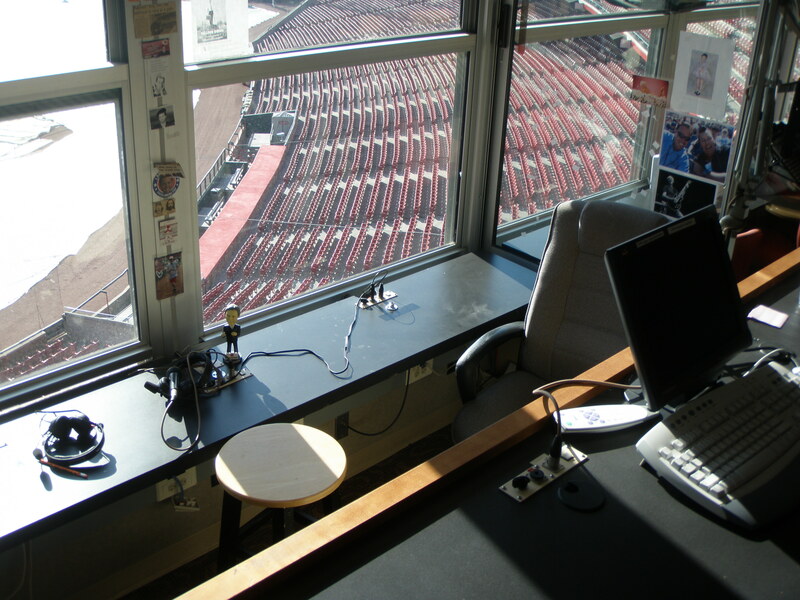 Here is the Reds home radio booth. You can see many various pictures hanging on the walls. Professional wrestler “Honky Tonk Man” is seen on the far right. This is the view of the field from the press box. You can see tests being run on the new scoreboard in the upper left. 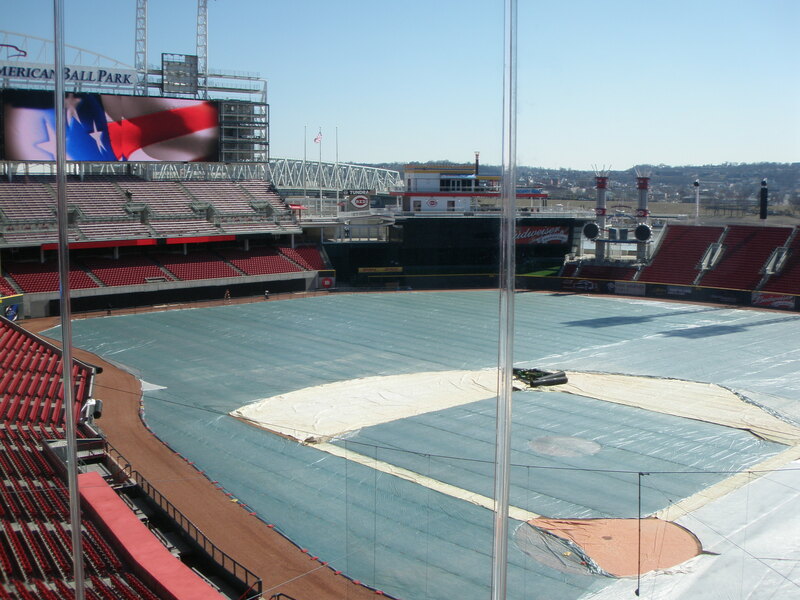 Also, you can see a tarp covering the playing surface. I am told that the tarp is to protect the grass from the circus animals visiting US Bank Arena next door. Thanks for stopping by. Y’all don’t need to go home, but you can’t stay here.